Petites Robes Genre Tailleur – Petty Dresses Tailor Style. Armholes — Overcast or bind armholes with a bias strip of soft lining silk or muslin. Buttonholes — Buttonhole sizes are determined by the diameter of the button. Sewing in Sleeves — When sewing in a sleeve, sew from the inside of the sleeve. That is, hold the sleeve toward you, for in this way the sleeve is eased into the waist. When the sleeve is sewn in try to keep the shoulder and under-arm seams from being tightened by the armhole stitching, as this often affects the fit of the waist. Front Seams of Sleeves — The front seam of a sleeve is placed about two or two and one-half inches from the under-arm seam of the waist. Another reliable guide often used is to fold the armhole from an inch back of the shoulder seam on a perfect bias. The point reached on the front of the waist is the guide for the front seam of the sleeve. Inside Seams of Sleeves — Bind or overcast the inside seams of a sleeve to correspond to the finish of the seams of the waist. Never leave them raw. Binding for Waist Seams — Binding for waist seams is easier to sew on evenly if the seam binding is creased in the center before it is placed on the edge of the seam. Stitches should be always short on the right side and longer on the under side of the seam. Covering Raw Edges — In place of bands of silk to cover raw edges, bone casing makes a nice finish and is frequently used. Seam binding serves the purpose where there is no strain or wear brought to bear on it. never be put in tightly, and four tackings, one at each end of the shield, one on the under-arm seam, and one on the seam of the sleeve, are quite enough. The tacking should be done through the little tape which finishes the shield. If the rubber is punctured the perspiration will come through and possibly ruin the waist; small safety pins are sometimes used to hold the shield in place. 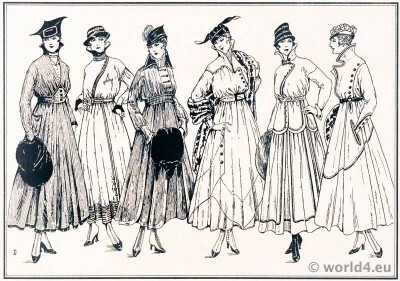 Sewing on Collars — When sewing on a collar to a waist do not have any fullness across the back of the waist unless the waist is designed for it. If the neck has stretched hold it in to the collar from the front to a little in front of the shoulder seam. Shoulder Seams — Shoulder seams should turn toward the front to avoid any tightening which the reverse would make. Cutting Material — It is always advisable to draw a thread before cutting fine materials, such as chiffon, etc. If this is not done the material has a tendency to creep away. The same method should also be followed in cutting lawn and fine white goods. In fact, it is always advisable to draw the thread whenever possible. Matching Patterns — Plaids or stripes should always be very carefully matched, especially when bias seams are made. Care should be taken to see that every line or check matches at every stage of the making. Shrinking Wash Materials — Washable materials should always be shrunken before being made up, but this does not mean that they need to be washed. Simply place them in a tub of water until they are thoroughly wet. Do not wring them out, but hang on a line by the selvage and allow them to drip. A little salt in the water will set the colors. Such shades as pink, blue, lavender and green should be hung in the shade when put out to dry, as the sun fades them quickly. Back Fastening — Dresses buttoned or hooked in the back should be fastened from right to left. How to Take Measurements for Patterns. There are several different makes of patterns on the market, each of which have their own points of excellence. The following few simple rules will enable you to order patterns of correct size with accuracy. If pattern for a skirt is wanted and the hips are larger in proportion than the waist, order by the hip measurement, and fit in the waist to the required size. The waist measure is determined by drawing the tape straight around the waist. To find the correct bust measure, pass the tape around the body and over the fullest part of the bust. The tape should usually be about an inch below the armhole and should have a slight upward slope at the center-back. Draw the tape comfortably tight. The length of waist is found by drawing the tape at center-back from neck to waistline and under the arm to waistline. Be sure the tape is in a perfectly straight line. The sleeve measure should be taken around the largest part of the upper arm which is usually about three inches below the armhole. To find the correct hip measure pass the tape around the hips about six inches below the waist line. The sleeve length can be more accurately determined if the tape is tied to the wrist and then adjusted on a straight line at both the back and the front of the arm. Pattern measurements for children’s, girls’ and misses’ garments are determined in the same manner as those for women, although it is advisable to give the age as well as the bust and waist measurements, which vary in children and girls of the same age.